Several coding methods are using to compress data objects efficiently. Data transmission can be compressed and decompressed in series or in parallel steps by using several codecs (coder & decoder) of different coding methods. Mixing of coding methods is using in many well-known methods: JPEG, Fax, MP3, etc. The use of mathematics such as statistics and Boolean algebra are vital for data compression. Mathematics and traversal technical knowledge in artificial intelligence, physiology and psychology are also applied to compress data effectively. Data compression is a mathematical science but it has a relation to the reality. Therefore this is a complex subject. 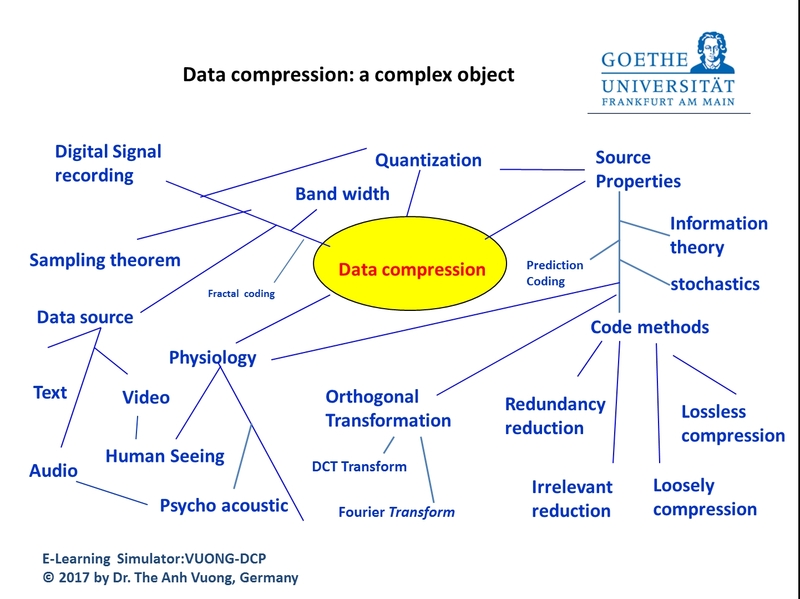 Data compression required strong theoretical thinking in many fields as transformation, numeric mathematics, stochastics, but it needs understanding in physics, physiological and psychology. Students have difficult to understand the correlation between the theoretical thinking and the real world (Text, images, video, tons), because they could not “see” or “hear” how it works by coding. To understand the blood flow in body or the function in a combustion engine, there are animated multimedia applications (video clips, web animations, power point presentations, etc. ), so that one could understand without conceptual knowledge in theoretical biology or mechanics. After many years experiment on a simulator for E-Learning data compression, it starts noon an open source project: vuong-dcp based on new architecture concept and developing with students at the GDV Informatics Institute of J.W. Goethe University Frankfurt am Main Germany. Comments and reviews for the project are welcome. This entry was posted in Data compression, Digital Transmission, E-Learning, Open source, vuong-dcp. Bookmark the permalink.